Diagnostic Features - All species polymorphic, with four or five worker classes, the largest usually functioning as soldiers. Eyes absent. Mandibles with the apical tooth long and acute (although the point is often worn away in older individuals), at least one other tooth on inner margin, usually more but larger workers with fewer teeth. Clypeus reduced so that antennal insertions are very close to the anterior margin of the head. Frontal carinae raised leaving the condylar bulbs of antennae exposed in dorsal view. Propodeum with its spiracle situated high on the side and far forward. Promesonotal suture present, mobile, metanotal groove absent. Pedicel of a single segment, but first gastral segment smaller than second. Pygidium impressed and armed at each side with a tooth or spine. Although there are six recognised subgenera only two, Dorylus sensu stricto and Typhlopone, have members known from Egypt or North AFrica. Tthe subgenera, the validity of which was confirmed by Gotwald & Barr (1980). The largest workers show the most distinctive development and Barr et al. (1985) and Gotwald (1985) recognized three groupings within the genus - Dorylus (including Anomma, Dichthadia and Typhlopone), Alaopone and Rhogmus - but felt unable to resolve whether the groupings should be regarded as full genera or simply subgenera. The subgenus Dichthadia is monotypic with a single species from South East Asia. The male "sausage fly" form of the genus are remarkable and those of Anomma driver ants are reputed to be the largest of all known ant morphs. Similarly, the special large "dichthadiigyne" special form of queens, which are wingless, without ocelli, and capable of periodic egg production on a very large scale are particularly characteristic. The hypogaeic (subterranean) forms are thought to feed mainly on termites, other ants and, in some cases, earthworms. The epigaeic forms, however, are generalized feeders (Hölldobler & Wilson, 1990, page 595), and are nearly all Anomma species (Gotwald, 1974). Hölldobler & Wilson (1995) give a somewhat poetic but graphic summary of driver ant activity, describing the colonies as "superorganisms". 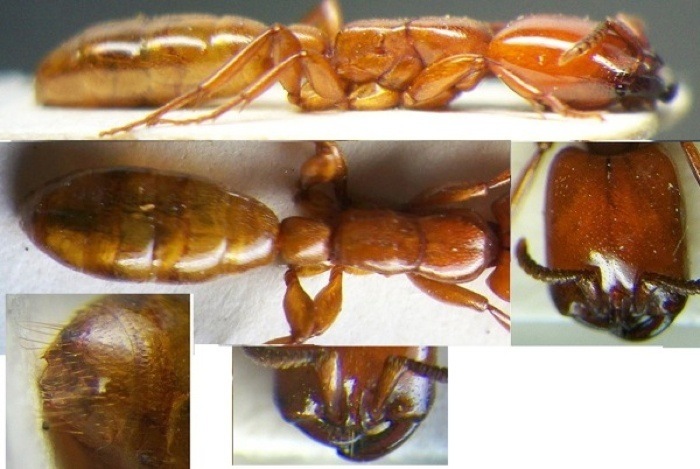 The similarity between the Dorylus driver ants of Africa and the Eciton army ants of the Americas now is accepted as being an example of parallel evolution, with no close relation between the two groups. Note: Borowiec (2016: 112) proposed that all the historic subgenera be simply synonymised under Dorylus. Rightly or wrongly, it is difficult to judge, but I (BT) find it unhelpful. Confusingly, Borowiec, then proposed the subdivision of the genus into a set of "species-groups". Both the following fall within his "Dorylus helvolus-group". Dorylus (Typhlopone) helvolus (Westwood, 1839: 219, worker); junior synonym oraniensis, Lucas, 1849: 302, illustrated, worker, synonymy by Emery, 1888b: 350) - record from Sinai by R von Frauenfeld (Mayr, 1862: 737). See below, Dorylus oraniensis is raised to species status here. 1 Impressed semi-circular area of pygidium without distinct margins .